The Biggest Ever BPM was a Big Success! BPM 2013 – the world’s biggest event for DJs - was a smashing success, hosting nearly 8000 visitors across two exhibition halls! People flocked from across the UK and around the world to the Birmingham NEC on the 14th, 15th and 16th of September 2013 to see the latest innovative products, an illuminating collection of educational sessions and an eclectic line-up of mind-blowing performances all under one roof. The level of stand and exhibitor effort was higher than ever, with impressive and interactive displays of the latest gear filling over 8,700sqm of space at the NEC – an increase of more than 600sqm compared with the 2012 show. The exhibitors were proud to show off their newest equipment, many of them saving important product launches especially for the show. 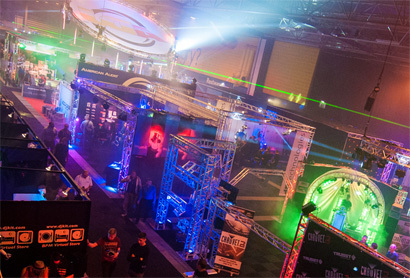 2013 gave BPM visitors the chance to see and interact with some really exciting kit, with product demonstrations, hands-on tuition and engaged staff once again helping make BPM the biggest and best DJ show in the world. The event also saw further growth in the entertainment technology sector, with lots of innovative lighting and effects equipment on display and an incredible 34 different PA systems showcased in the event’s PA Experience feature. BPM 2013 embraced both a knowledgeable, industry-aware audience and visitors just beginning to dip their toes into all exhibitors had to offer. Both groups, and everyone in between, left satisfied, excited and inspired by what the future of DJing holds, offering invaluable feedback to exhibitors in the process. The education sessions were once again a hugely popular feature of the show and included ten sessions targeted at mobile DJs hosted by Pro Mobile. There were also live Q&As with Faithless founder member Sister Bliss, radio and club DJ Spoony and the ‘Godfather of Rave’ himself, DJ Slipmatt. The numerous educational seminars, workshops and panel sessions in the coloured ‘Learning Spaces’ also enjoyed unprecedented attendance – some were standing room only! BPM 2013 featured innovative and entertaining performances from new talent and big names, including DMC world champion Shiftee, Futuristic Polar Bears, [PROJ3CT], Andy Whitby, Tim Cullen, James D’ley and the four-deck master Delimentary. A highlight of BPM 2013 was the first-ever Video Party, which saw hilarious and high-energy audiovisual performances from rising stars the Video Geeks and headliner Beat A Maxx. The Vestax Dance Classics party was also as popular as ever, with a live PA by Alison Limerick and infectious sets from Davos, Slipmatt, Ian Redman (Ultrabeat) and Mike Lewis (N-Trance). As well as established artists, BPM is committed to showcasing emerging talent and the getinthemix.com PLAY@BPM stage kept the queue entertained with back-to-back 30-minute sets from the hottest up and coming DJ talent. BPM’s move to earlier dates, a decision led by exhibitors following the London PLASA show’s shift to BPM’s usual slot, resulted in an interesting visitor split. Although attendance on Saturday was down, Sunday the 15th of September saw the highest single day visitor figure BPM has ever attracted, with over 3,100 crowding through the doors. Monday numbers remained steady, although the visitor profile shifted significantly. Less education visitors attended, which can be attributed to the show taking place close to the start of term, however there was a huge increase in trade visitors. Overall, despite being forced to move the 2013 event forward by three weeks, BPM enjoyed a healthy attendance of 7,849. The organisers of BPM are committed to continually improving and adapting the event to meet the needs of both visitors and exhibitors. Everyone who attended this year’s event is encouraged to take part in a short online visitor survey: www.visitbpm.co.uk/feedback. To thank participants for their valued input, everyone who completes the survey will be automatically included in a free prize draw to win a pair of VIP tickets for the next BPM event. Plans are already well underway for growing BPM to new heights in 2014. Following the success of the 2013 event, organisers Marked Events Ltd have already been approached by a number of new exhibitors keen to make their debut at the next show. BPM has now firmly established itself as the first exhibition of the autumn calendar, and with exhibitors favoring its ease of access and central UK location, the future is very promising for this continually expanding show.